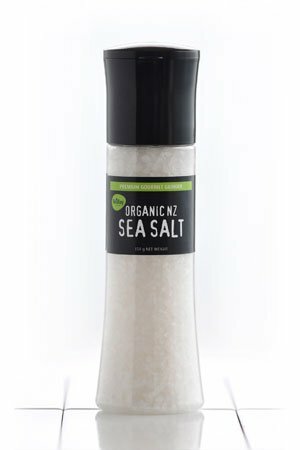 Our New Zealand Organic Sea Salt is solar harvested from the clear waters of the great southern oceans. These waters are evaporated using the natural process of sun and wind. Our Sea Salt contains higher levels of Calcium, Magnesium and other minerals than normal table salt as these minerals are naturally present in sea water. “The seller” refers to Findlay Foods Ltd. “The buyer” refers to any person or legal entity purchasing from the seller. The seller’s website, the information on it, and any information in emails constitute an invitation to treat, and not an offer to supply products. When the buyer orders products from the seller, this constitutes an offer from the buyer to buy those products in accordance with these Conditions of Use. The seller’s acceptance of the buyer’s order occurs (and the contract is formed) when the goods are dispatched to the buyer. The buyer may order products from the seller by completing and submitting the checkout process on the seller’s website. The buyer must provide all information required (including name, email address and payment details) or the seller may not be able to process the buyer’s order. The seller reserves the exclusive right to accept or reject (for any reason whatsoever, and in whole or in part) any order submitted by the buyer. If the seller rejects the buyer’s order (or any part of the order), any money paid by the buyer in relation to the rejected part of that order shall be refunded, and the seller shall have no further liability to the buyer in relation to the rejected part of the order. All pricing is displayed in New Zealand Dollars and is inclusive of GST. All orders are subject to availability of products. If for any reason a product is not available, the seller will endeavour to notify the non-availability on this website. The seller may revise the range of products or the specification of any product at any time and without notice to the buyer. Once an order has been made and processed, it cannot be cancelled. No returns are accepted unless advised within 48 hours of receipt of the goods. Findlay Foods Ltd must be contacted, and agreement reached, prior to any goods being returned. Goods being returned must be in good condition, and unopened. All freight costs to be at the purchaser’s expense. Goods cannot be collected from the seller. Goods are generally shipped to the buyer on same or next business day via “Track and Trace” couriers. Courier costs are calculated on the weight, volume and destination of the article. Delivery is generally within 3 business days from dispatch (4 days for rural delivery). Liability for shortage in the quantity of goods delivered is limited to making up the shortages. Where the buyer believes there is a shortage in the quantity of product delivered, the buyer must notify the seller of any such claim within 7 days of delivery, and must provide the seller with a reasonable opportunity to investigate that claim. Goods leaving the seller’s premises are adequately packed. Claims for any loss or damage must be made against the carrier in the prescribed manner. In lieu of any warranty, condition, or liability by law, the seller's liability in respect of any defect in or failure of the goods supplied, or for any loss, injury, or damage attributable thereto, is limited to making good the replacement or repair of defects arising under normal proper use and maintenance arising solely from faulty design, materials, or workmanship within the guarantee period, if stated, or otherwise within 6 months of the date of supply, provided always that such defective parts are promptly returned to the seller, unless otherwise arranged. The warranty does not cover damage from misuse, accident, negligence, inappropriate or improper operation, maintenance, installation, modification or adjustment.